The Broadway Park Redesign Project was a response to a major public work in central Ann Arbor: the rebuilding of Broadway Bridge over the Huron River and redesign of an adjacent public park . Broadway Park was an isolated three-acre meadow, bounded by the river, the Michigan Central railroad tracks, and the bridge embankment. It was largely neglected except for an encampment of homeless Ann Arborites, who were themselves being displaced by the bridge reconstruction. The Department of Parks and Recreation planned to redesign Broadway Park for greater access and broader usage. City officials invited the UM Arts of Citizenship Program, which I directed, to contribute to community feedback on the park redesign. Our research underscored the rich history of the riverfront district, called Lower Town, that adjoined the bridge and park. Lower Town had been the heart of Ann Arbor's mill economy and the anchor of its black and immigrant communities. The bridge site abutted the old Michigan Central rail terminal (now a restaurant) and an older river ford that was part of a Native-American trail system. For most Ann Arborites, these histories were as invisible as the park itself. The first outcome was an educational project called Students On Site (described here). It used the story of Lower Town to teach community history to elementary-age learners in the Ann Arbor schools. The Broadway Park Redesign Project emerged as an offshoot of this school partnership. UM landscape architect Bob Grese partnered with Mary Van Alstyne of Bach School to create a unit in his master's studio on designing Broadway Park as a child-centered space. Grese's students did a joint field trip with Van Alstyne's first- and second-graders and and presented design proposal to their young 'clients' two weeks later. As discussed in my article, "Putting the Academy In Its Place," this experiment in collaborative place-making was valuable to the civic learning of both generations. But it did not affect Broadway Park, which languished while the bridge was being built. Completion of the bridge, which incorporated overlooks and paths into the park, re-activated the Broadway Park Redesign Project. In 2002, I taught a graduate architecture course, Landscape, Place, and History, that melded a seminar on how landscapes embody social memory with a public-history and design practicum on Broadway Park. Students created a website, Broadway Park: Renewing Ann Arbor's Public Riverfront, that included a searchable documentary archive, an interpretive timeline of the district's development, and topical sections on its social and environmental history. Their historical research reconstructed the transformation of the Huron riverfront from a landscape of mills and water power to one of public recreation and electric generation--a shift in which Broadway Park was left behind. 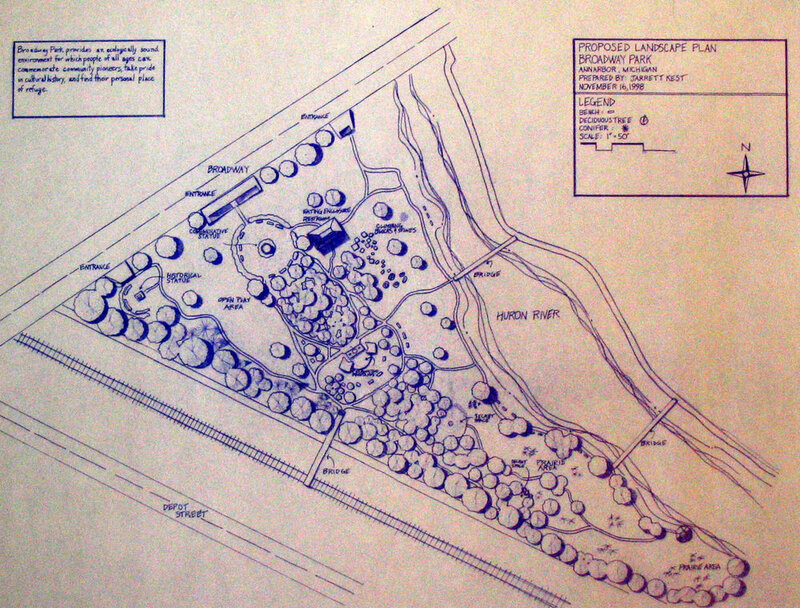 The website included a gallery of design proposals for opening and renewing the park; and one of the seminar participants, Karen Kortesoya, produced a master's thesis on the park. Finally the website provided a feedback space where the public could "Join the Conversation" on renewing the park. Working with city planner Amy Kuras, the students and I presented our research and design proposals at community meetings. Above: Field trip to Broadway Park by landscape-architecture and Bach School students; conceptual plans to redesign park as child-centered space; client presentation at Bach School. Below: Maps, plans, and historical documents from website, Broadway Park: Renewing Ann Arbor's Public Riverfront.